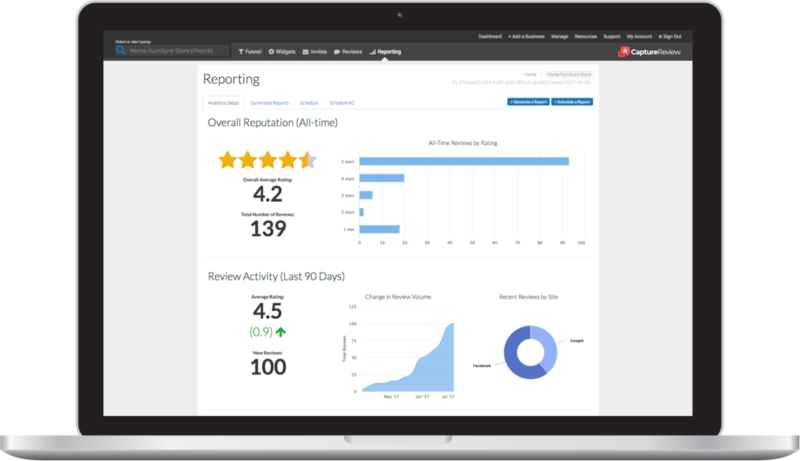 Generate Real, Authentic Reviews On Multiple Online Review Sites Including Google, Facebook, Yelp, TripAdvisor and countless more. Automate multi-channel review acquisition campaigns via email, text message and print. Optimize review volume on Google, Facebook and the industry-specific review sites that matter to you. Protect your reputation with a system that proactively catches unhappy customers for offline recovery. Alert everyone on your team who needs to know when new reviews are published on the Web. Respond from a central “Command Center” for reviews and keep track of issue statuses. Report on trends and ROI for reviews of yours and your clients’ businesses. Stream latest and greatest reviews to show social proof in websites and sales channels. Share positive reviews as compelling and automated social media content. Showcase reviews in SEO-friendly markup on-site to drive visibility in search.